Chris Beck was mentioned as a potential top 10 draft talent after a very good sophomore year at Georgia Southern and a strong performance in the prestigious Cape Cod League in 2011. He bulked up going into his junior season muscle-wise, and apparently lost some flexibility and/or conditioning. His numbers slipped a bit (3.91 ERA, 1.41 WHIP) and reports were that his mid 90s fastball had dropped to around 90. After a brief visit to Great Falls in his draft year, he skipped A-ball in 2013 to go to Advanced-A Winston-Salem, and earned a promotion to AA Birmingham that same year. His combined 3.07 ERA and a strong GB rate (1.53 GO:AO) were the highlights, but his peripherals were not impressive (79 K, 45 BB, 11 HR in 146.2 IP). 2014 was more of the same across AA and AAA: good control (2.6 BB/9), solid ERA (3.39), decent ground ball rate (1.19), but still not missing many bats (5.1 K/9). In 2015 improved his strikeout rate (to 6.6 K/9) with Charlotte and posted strong results overall through mid-June (3.15 ERA, 1.18 WHIP, 2.3 BB/9) and he even made a shaky spot start with the Sox. Unfortunately he was shut down in mid-June, and it turned out he required surgery, which he had in the fall - Ulnar Nerve Translocation (same surgery Micah Johnson had last year). In 2016, Beck bopped back and forth between Chicago and Charlotte, mostly in relief, putting up so-so numbers and struggling with the strike zone. 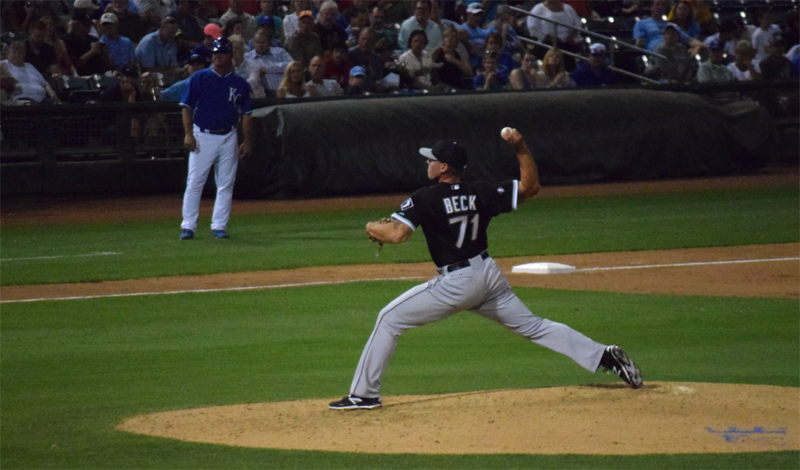 Beck's best pitch is his sinker that runs 92-95 (and has touched 96). He also throws a cutter, slider and a good change. 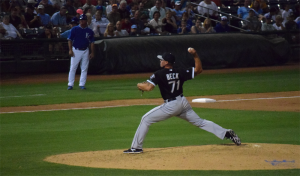 For Beck, his sinker-change combo works well when he's down in the zone. When he tires or loses delivery consistency, he tends to leave the ball up and get hit, especially on his offspeed stuff. If he can stay down consistently, he's got a future in the back of a major league rotation. His time in the majors also showed a tendency to tighten up under the bright lights, but that may fade with time. Beck looks like a long reliever and spot starter at this point, shuttling between Charlotte and Chicago.